Knowing the right size of the tank you need for your storage tank hot water heater needs is a crucial part of buying hot water heaters. To be able to properly size a storage water heater for your home, this includes heat pump water heater with a tank, use the water heater's first hour rating. The first hour rating is the number that states the number of gallons of hot water the heater can supply per hour, starting with a tank full of hot water. This number depends on the tank capacity of the hot water heater, source of heater for the water heater (burned or element), and the size of the burner or the element for the system. Almost all the new conventional storage type hot water heaters have an EnergyGuide label in the top left corner which will have the first hour rating, stated as "Capacity (first hour rating)." According to the Federal Trade Commission requirements, all the new conventional storage water heaters are needed to have an EnergyGuide label, but not the heat pump hot water heaters. Product literature from a manufacturer may also provide the first hour rating. Look for water heater models with a first hour rating that matches within 1 or 2 gallons of your peak hour demand -- the daily peak 1-hour hot water demand for your home. Use the worksheet below to estimate your maximum usage of hot water during this one hour of the day—this is your peak hour demand. Note: the worksheet does not estimate total daily hot water usage. The worksheet example shows a total peak hour demand of 36 gallons. Therefore, this household would need a water heater model with a first hour rating of 34 to 38 gallons. Imagine you just bought your first instant hot water heater a.k.a. tankless hot water heater. You plug the system and start reaping its numerous advantages of providing instant hot water while conserving energy. And then you figure out, the output of the system is not enough for your needs. This throws you back to square one with inadequate hot water supply. Hence, sizing you tankless water heater is one of the most important things you need to do. Tankless or demand-type water heaters are rated by the maximum temperature rise possible at a given flow rate. Therefore, to size a demand water heater, you need to determine the flow rate and the temperature rise you'll need for its application (whole house or a remote application, such as just a bathroom) in your home. First thing you need to do is figure out how much total flow rate you will need. Hence, decide how many hot water devices you would use at the same time. Then, add up the flow rates for all the devices and that’s the flow rate you will want for your tankless hot water heater. For example, let’s say you would be using two hot water faucets at the same time. Each faucet has a flow rate of about 0.50 gallons per minute. On top of that, you may also be using the shower while you would be using the faucets. The flow rate for shower would be around 2.5 gallons per minute. Hence, the flow rate through the tankless hot water heater should be at least 3.50 gallons per minute. This should explain how you calculate the required flow rate for your demand hot water heater. If you want to reduce the flow rate, you will need to install low-flow water fixtures. To determine temperature rise, subtract the incoming water temperature from the desired output temperature. Unless you know otherwise, assume that the incoming water temperature is 50ºF (10ºC). For most uses, you'll want your water heated to 120ºF (49ºC). In this example, you'd need a demand water heater that produces a temperature rise of 70ºF (39ºC) for most uses. For dishwashers without internal heaters and other such applications, you might want your water heated at 140ºF (60ºC). In that case, you'll need a temperature rise of 90ºF (50ºC). 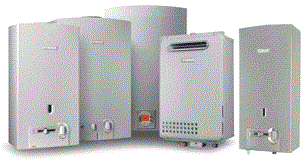 Most demand water heaters are rated for a variety of inlet temperatures. Typically, a 70ºF (39ºC) water temperature rise is possible at a flow rate of 5 gallons per minute through gas-fired demand water heaters and 2 gallons per minute through electric ones. Faster flow rates or cooler inlet temperatures can sometimes reduce the water temperature at the most distant faucet. 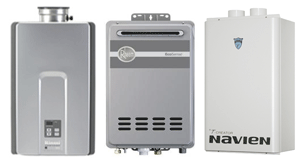 Some types of tankless water heaters are thermostatically controlled; they can vary their output temperature according to the water flow rate and inlet temperature.